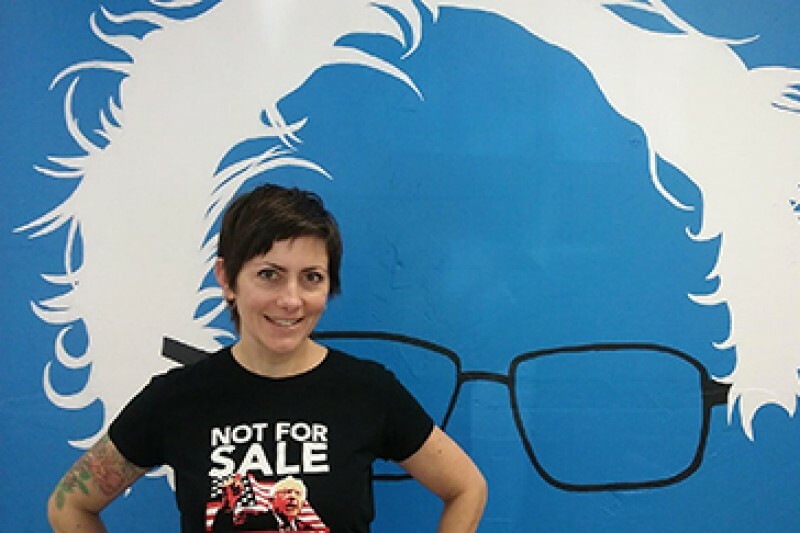 Emilie Mitcham has been a Bernie activist since the first day she found out he was running for the nomination. She didn't know every detail of his position on every issue, but she knew him to be a man of integrity, and a man who was not afraid to speak truth to power. The more she learned about him, the deeper and deeper her commitment grew. She is a forty-seven year old, mother of four boys and because of Bernie's presidential run, has finally joined a political party for the first time in her life. Prior to Bernie's run, she voted as an Independent, mostly aligning herself with the Democrats. Her parents are Democrats, and it would have been natural for her to register as a Democrat, but she could never bring herself to do so until Bernie Sanders declared his candidacy as a Democrat. To her, it has always felt as if the Democrats were slowly but surely giving their voices over to the corporations, and conceding their power to the forces on the right, to the war industry, and to corporate interests. Without Bernie's candidacy and his advocacy for a real change and a democracy that is "for the people, by the people and of the people" she felt she could not distinguish the differences between the Democrats and the Republicans, and she was wary of what looked like a system that was not really running in the interests of the people but was instead, running primarily for the best interests of profit for industry and power for a small group of elite. With Bernie Sanders, she believes American citizens have a chance to put a person of integrity in the White House who understands the real frustrations of a country governed by special interest groups, the war industry, big money, and the buddy system. Emilie will fight for Bernie's nomination at the National Convention as hard as she has fought for his nomination here in Colorado. She has been a "boots on the ground" volunteer since day one, engaged in everything from canvassing to event planning, to marches. She was elected as a National Credentials Committee member and is working hard to learn her role in this job. She was on the Colorado State Credentials Committee and also the Jefferson County Credentials Committee. Emilie is a paralegal, a painter, and a writer. You can read some of her writing on www.elephantjournal.com and also on Medium. You can see her paintings on www.emiliemitcham.com. She works for a small family firm in Wheat Ridge called Affinity Fundraising Registration. Affinity helps non-profit companies register with the states, so that they can fundraise legally in those states. She welcomes contact with the people from CD 7 who elected her, and with other engaged Bernie supporters. You can reach her via Facebook, and if you would like to become more involved in helping get Bernie elected but aren't sure how to help, feel free to reach out to her on Facebook. Thank you to everyone for their contributions and for the support and encouragement. We are going to close this GoFundMe account this week. Emilie has recently continued her activism by filling a vacancy in her small town council (six members plus the mayor) in Mountain View, CO. And she will be working to help spread the word about several grassroots initiatives on the Colorado November ballot. Please don't hesitate to reach out to her if you have questions about how to get involved in the issues that matter to you most. Emilie's own involvement this year came about partly because she asked questions and because others with more experience were generous in their offers to help her become more oriented to the process of being an engaged citizen. Thanks for all of your hard work, Emilie! Give 'em hell in Philly, Emilie.